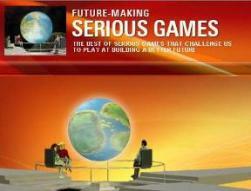 Serious Games To Conquer Retirees As Well? Inspired by SharpBrains compelling proposition of making Brain Fitness available to all by bringing to market neuroscience-based products, a.k.a. "brain gyms" (please find also my previous post Serious Games for Healthy Aging and Job Performance), I came across The New York Times article: Video Games Conquer Retirees . The combination of SharpBrains inspiring approach with the article's anecdotal evidence, has raised my awareness of a sizeable Serious Games market segment: Retirees. In a modest but stately compound called St. Mary of the Pines, 52 retired members of the School Sisters of Notre Dame spend much of their time as the order’s members have since the 19th century. They read and garden, fish and sew. They pray five times a day. But many also have a new hobby, one they credit for keeping their hands steady and minds sharp. They play video games. Every day residents go to the seven-terminal “Computer Cove” to click furiously on colorful, nonviolent, relatively simple games like Bejeweled, Bookworm and Chuzzle. Though they live in a remote grove, the women of St. Mary are actually part of a vast and growing community of video-game-playing baby boomers and their parents, especially women. 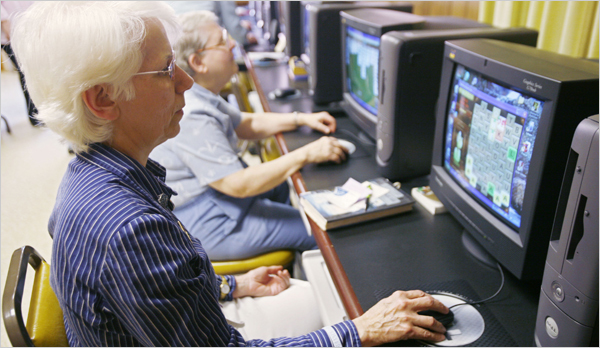 Spurred by the popularity of the Nintendo Wii game system among older players, Erickson Retirement Communities, based in Baltimore, which manages 18 campuses around the country with 19,000 total residents, is installing the consoles at each location. It turns out that older users not only play video games more often than their younger counterparts but also spend more time playing per session. Pogo.com is a Web site that offers “casual” games, easy to play and generally less complicated than the war, sports and strategy games favored by hard-core gamers. 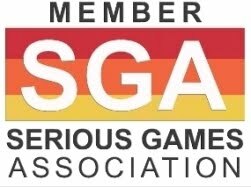 According to Electronic Arts, the game publisher that runs the site, people 50 and older were 28 percent of the visitors in February but accounted for more than 40 percent of total time spent on the site. On average women spent 35 percent longer on the site each day than men. A couple of hours before heading to a harmonica concert recently, Sister Jean-Marie Smith, 61 and a retired teacher, paused her round of Bookworm (a digital take on the classic Scrabble word game) at the prodigious score of 34,765,180 to explain how she joined the gamer generation after moving to St. Mary last summer. The game industry has been pleasantly surprised to discover this growing audience that is more familiar with Little Richard than Ludacris, and some companies, particularly Nintendo and makers of easy-to-play casual games, have begun to cater specifically to older players. Jim Karle, a graduate student in the department of psychology, neuroscience and behavior at McMaster University in Hamilton, Ontario, reported last year that preliminary experiments indicated that playing video games could have a beneficial effect on short-term memory. Mr. Karle has not applied his research directly to older subjects, he said, but he may not have to. He has witnessed the increased popularity of gaming among older players first-hand.